Nefi Lopez grew up in Tomball, Texas – a small town about an hour north of Houston. In high school, Nefi excelled at both athletics and academics. Nefi graduated towards the top of his high school class; in sports, Nefi and the Klein Bearkats won several district and area championships in both football and track and field during his three years starting on varsity. Nefi competed in sports while also participating in Klein’s interscholastic Speech and Debate team and was member of the Klein Band as a saxophone player. Following his high school career, Nefi attended Houston Baptist University as one of the program’s inaugural football team members and played fullback and defensive line for the Huskies under head coach Vic Shealy. In college, Nefi’s academic success continued. Along with competing on the football team, Nefi competed in the university’s mock trial team representing Houston Baptist University around the country. As the captain of the Husky Mock Trial Team, Nefi competed and won numerous national tournaments and received a number of awards as an advocate and a witness. Nefi was also a member of numerous honor societies and graduated with a bachelor’s degree with a focus in Governmental studies. After graduation from Houston Baptist University, Nefi attended law school at South Texas College of Law Houston. In law school, Nefi quickly became a member of the law school’s nationally recognized mock trial and moot court programs under Dean T. Gerald Treece and Rob Galloway. Just after his first year of law school, Nefi won the T. Gerald Treece Summer Trial academy and received the only Best Speaker Award. Nefi went on to win the T. Gerald Treece Summer Trial academy again the year after. Ultimately, Nefi competed as a varsity advocate in over 16 mock trial and moot court competitions across the country. Months after taking the bar, Nefi received his license to practice law in Texas from the State Bar of Texas. Following graduation from law school and taking the Texas Bar, Nefi worked as an associate attorney at a high pace boutique personal injury firm called Johnson Garcia LLP where he received immediate and invaluable experience under the leadership of highly esteemed lawyers Daniel Johnson and Juan Garcia. Since then, Nefi joined Evans & Powell, PLLC where he heads the personal injury sector of the firm. 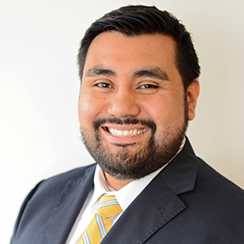 Nefi works as a lawyer by day and by night as a coach for the mock trial and moot court teams for his alma maters, South Texas College of Law Houston and Houston Baptist University. Additionally, Nefi is actively involved in the legal community and is a proud member of the Hispanic Bar Association, Texas Young Lawyers Association, Mexican American Bar Association, Garland R. Walker American Inn of Court, Hispanic National Bar Association, American Association for Justice, Houston Trial Lawyers Association, Houston Bar Association and the Texas Trial Lawyers Association. As a licensed attorney, Nefi continues to work on a wide range of cases in civil litigation, representing people injured as a result of the negligence and carelessness of others and represents a number of companies and/or individuals in personal injury and business disputes. Let Nefi help you.